Jack the Ripper is of course a well-known serial killer, but one who to this day remains a mystery in terms of who he was and why he did what he did. That makes his story perfect for fictionalizing. And Maniscalco does a fabulous job of it. 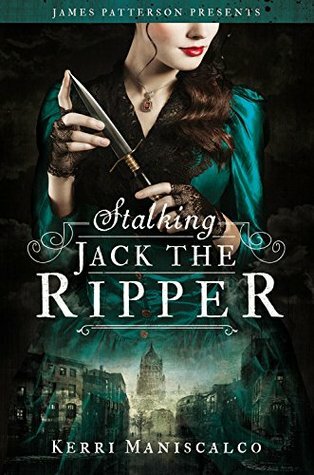 Combining the mystery of Jack the Ripper with her own interests in forensic science, Maniscalco has created a powerful tale of science, madness, and relationships gone awry. Ever since her mother's death which lead Audrey Rose to abandon her faith in God, her curiosity has lead her to an interest in her uncle's work as a forensic scientist (an early version of a medical examiner). But her father's rather paranoid need to protect her from every germ known to man (her mother died of scarlet fever which she caught tending Audrey Rose) means that Audrey Rose has to sneak around behind her father's back. Things become more complicated when Audrey meets her uncle's assistant, Thomas, who she finds to be attractive but also amazingly obnoxious. Dealing with her own complicated feelings for Thomas while avoiding detection by her father makes her efforts to help her uncle difficult. But after Jack the Ripper's first victim is found, Audrey finds herself drawn in, compelled to help stop the monster responsible for such destruction. But a connection to her own family leaves Audrey wondering if she really wants to know the answer to the question: Who is Jack the Ripper? The incredible details related both to the historical time period as well as early forensic science creates a book that I had a hard time putting down. The relationships between characters also left a lot of questions about who is interested in who and who can be trusted. And the shocking truth about Jack the Ripper's identity (the fictionalized Jack the Ripper of course) leaves both Audrey and the reader stunned to say the least. I will say that the choice of villain and the focus on forensic science means the book is quite gruesome. I wouldn't recommend this for someone who doesn't have a strong stomach. But those readers who enjoy a well-written mystery and enjoy shows such as CSI or NCIS, this one is a must. I also appreciated the author's note at the end where the author explains what she fictionalized. I learned things about the real Jack the Ripper I didn't know that make it clear that the man was very, very sick in his head.